Two former pet handlers hired by United Airlines spoke with NBC Bay Area's Investigative Unit on what they describe as animal neglect in the company's Pet Safe program. We traveled to Washington, DC to talk to the regulators who are tasked with preventing this kind of neglect. Two whistleblowers who asked for anonymity to protect their careers told us that these are sometimes false promises. United also says pet owners can “track pets from origin to destination.” But our whistleblower argued that the carrier has a hard time keeping track of where the animals are even being shipped. "I was there when they sent a dog that was supposed to go to Florida to Kong Hong," he said. "And somebody just put it on the wrong plane! That person was back at work two days later." The whistleblower and his former employee contacted NBC Bay Area after seeing our investigative story in November on what happened to Janet Sinclair’s dog Sedona. “She was dying, literally, right in front of me," Sinclair told us. From an aisle seat on a plane, Sinclair filmed cell phone video of what appeared to be Sedona’s crate on the tarmac in 90 plus degree heat during a layover in Houston. Sedona was so badly hurt that Sinclair spent nearly $3,000 dollars in veterinary bills. Janet Sinclair says her greyhound sat on a tarmac in Houston in 91 degree weather when it was supposed to be in a climate controlled environment at all times. The former holding facility manager told us, “I reached out to her, being somebody on the inside, and I just wanted to tell her: I am not surprised at all." He said he witnessed problems like these and even sent photos documenting the issues to United supervisors. The photos, which we had access to, depicted animals that are clearly bloated and sick. In another, a dog can hardly reach the water bowl in its crate. United denied several requests for an interview. Instead, the carrier released a statement. The former manager told us, “Bottom-line is they need to change procedure. Change regulations for the health of the animals. Not for the sake of making money. And you know, people need to be held accountable." Finding who is accountable is harder than it sounds. By law, airlines that transport animals must report incidents directly to the Department of Transportation. Those reports are sent once a month to the USDA, which can then investigate and take action. The Investigative Unit sat down with Dr. Gerald Rushin, a Staff Veterinary Medical Officer. Rushing explained that the agency “can levy fines up to $10,000 per incident.” Rushin argued that incidents can be discovered and prevented during unannounced USDA inspections. But what happens if an incident isn't discovered in an inspection or even reported to the Department of Transportation? In the case of Janet Sinclair’s dog Sedona, the incident happened last summer, and a DOT spokesperson reports United still hasn’t reported it. The DOT told us that the rules require airlines to report the “loss, injury or death” of pets while in the custody of the airline. “Illnesses are not required to be reported,” said the spokesperson. If Sedona’s injuries were determined to actually be “illnesses” the incident would not have to be reported. Pet owners who contacted the Investigative Unit have said that airlines are getting away with not reporting when incidents do happen. On average, USDA inspectors visit airports across the country two to three times a year. If complaints are filed, they will sometimes visit more often. But during the four months whistleblowing pet handlers were sending emails to United supervisors, we could not find evidence of any unannounced USDA inspections at that particular airport. According to DOT animal incident reports, more than 400 animals have died, been injured, or have flat out disappeared in the care of airlines since 2005. 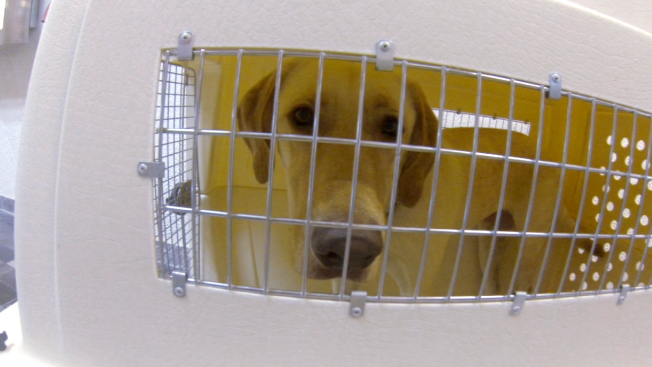 The airline industry argues that hundreds of thousands of pets are shipped every year safely. Meanwhile, the USDA says that if anything happens, travelers should report it directly to them. Embedded below are emails sent from a pet care company that contracts with United as part of its Pet Safe service. The emails detail a manager and an employee's attempts to alert managers at United to chronic neglect often ending in injury or death to pets in cargo. The names of the whistle blowers and other identifying details have been redacted to protect the identities and careers of the senders.